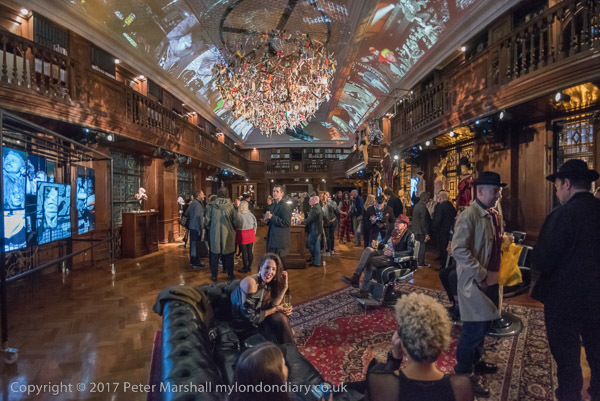 All pictures Copyright © Peter Marshall 2017, all rights reserved. 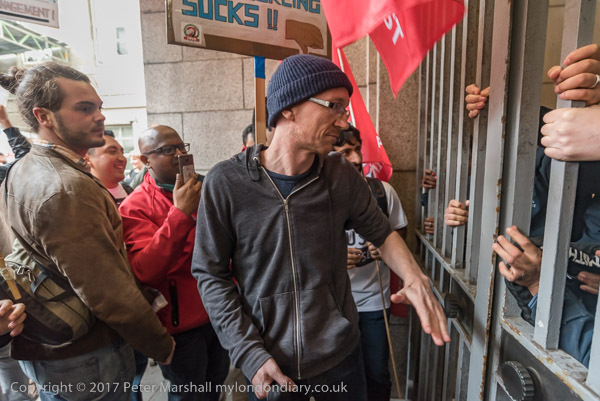 United Voices of the World (UVW) trade union protest against Kensington luxury car dealers HR Owen and demand they reinstate their two cleaners suspended without pay because they asked to be paid a the London living wage for cleaning the Ferrari / Maserati showrooms. Cleaners Angelica Valencia and Freddy Lopez were supported by the UVW, and other groups including Class War and the RCG. Around a hundred protesters marched from South Kensington station, protesting briefly outside the Lamborghini showrooms and office entrance to HR Owen, before marching down the Old Brompton Road for a lengthy and noisy protest with speeches, chanting, drumming and dancing outside the Ferrari showroom, blocking the road for around two hours. A row of security men from Templewood who employ the Ferrari cleaners stood outside the building. Both Templewood and HR Owen have denied responsibility for paying low wages and the UVW is pursuing legal claims for unlawful deductions from wages and breach of minimum wage legislation on behalf of the two cleaners. Several groups of protesters converged on St Thomas' Hospital to call for an end to immigration checks and charging of migrants for NHS services organised by Docs Not Cops. 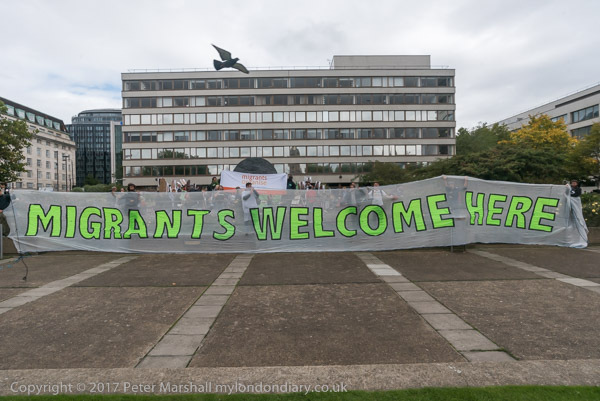 The Migrants Welcome bloc, Maternity Care bloc and Sisters bloc met opposite the hospital and marched onto the area around the memorial to Jamaican -born Crimean War nurse Mary Seacole for a rally at which a number of testimonies of those who have suffered from these policies were read out. Checks on immigration status have led to deaths and serious illness because some have been refused medical services or have not sought treatment because they fear deportation. Others given NHS treatment have been presented with large bills they have no means to pay, even though they may have paid tax and National Insurance while working here. NHS medical bills are often huge for individuals but their total of such fees is an insignificant fraction of a percent of NHS costs and campaigners call for them to be abolished and for an end to the scapegoating of migrants and for an end to the policy of the deliberate creation of a hostile environment for migrants and asylum seekers. Stop the War Coalition and Campaign for Nuclear Disarmament held a 'No Nuclear War over North Korea' rally at Downing St.
A deputation delivered a letter to Theresa May calling on the UK government to support a peaceful end to the war of insults and provocations between the USA and North Korea and to prevent any escalation to a nuclear war which would threaten everyone on the planet. Outsourced workers at the University of London, including security staff who have not received the increases in salary promised to maintain differentials since 2011, held a noisy protest at the university calling for an end to outsourcing. They had marched with other precarious workersfrom an early morning 'End Precarious Labour!' rally at Transport for London on the day that Uber's appeal against the ruling that their drivers are workers is being heard to hold a rally outside Stewart House at the east side of Senate House. The protesters demand the university acknowledges and takes back responsibility for all those who work on campus by employing them directly and providing proper sick pay, holiday pay and pensions. As well as paying low wages and giving minimal benefits, outsourcing contractors are often very slow to pay, causing considerable hardship for these low paid workers. After speeches, the workers and supporters protested noisily at the gates of Senate House which were locked against them. A few made an attempt to push the gates open, but did not suceed, perhaps intentionally. They then marched around the street to the west entrance to Senate House and protested there for some time, before going on to Birkbeck, where they entered the foyer and protested for a few minutes inside there before going back for a final short rally outside Stewart House. 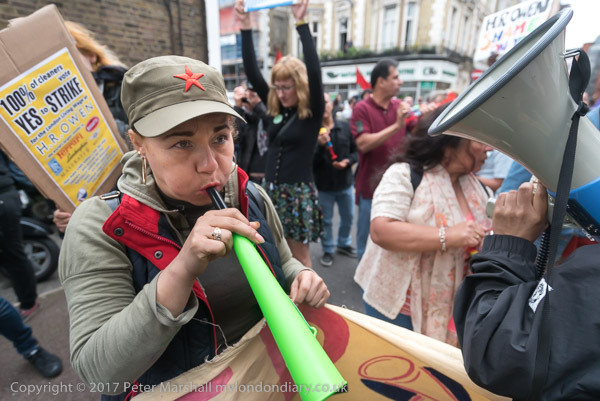 Strikers at the Ritzy Cinema in Brixton celebrate a year of strike action with a rally supported by other trade unionists, including the United Voices of the World and the IWGB and other union branches. The BECTU strikers demand the London Living Wage, sick pay, maternity and paternity pay, for managers, supervisors, chefs and technical staff to be properly valued for their work, and for the four sacked union reps to be reinstated. There were a number of speeches in English and in Spanish, including news from other campaigns elsewhere, some successful and others ongoing; a minicab driver involved in the campaign by IWGB to get Uber to recognise the court judgment that their drivers are workers was critical of TfL and Mayor Khan for not highlighting Uber's failure to meet their responsibilities to their staff. The Ritzy had closed for the event taking place outside. 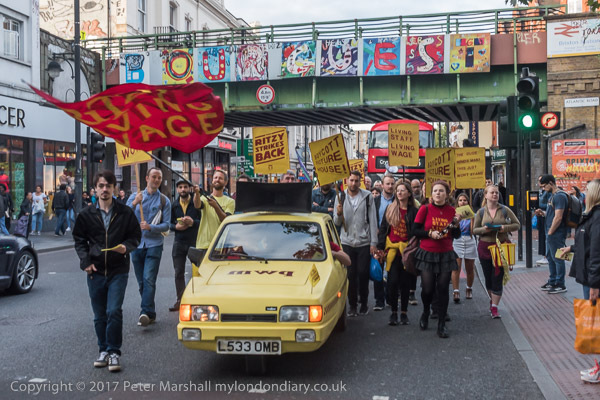 A surprise came with the arrival to cheers of a newly acquired 'Precarious Workers Mobile' bright yellow Reliant Robin, equipped with a powerful amplifier and loudspeaker, and after more speeches this led the protesters in a slow march around central Brixton. I rejoined them as they came out of Atlantic Rd to march down the Brixton Rd past the Underground station. 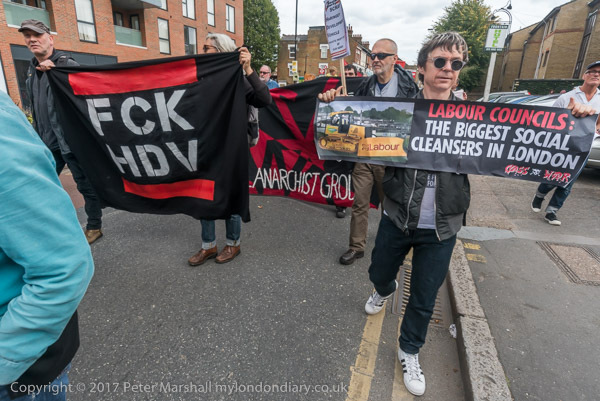 Hundreds marched in North London from a rally in Tottenham to Finsbury Park against the so called 'Haringey Development Vehicle', HDV, under which Haringey Council is making a huge transfer of council housing to Australian multinational Lendlease. 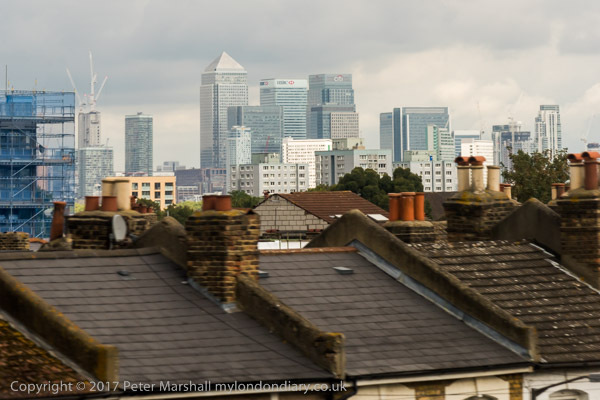 This will result in the imminent demolition of over 1,300 council homes on the Northumberland Park estate, followed by similar loss of social housing across the whole of the borough. At £2 billion, this is the largest giveaway of council housing and assets to a private corporation yet in the UK, but similar schemes have already resulted in the loss of truly affordable housing and social cleansing in other boroughs including Southwark, Lambeth and Barnet, and there were several groups and speakers from estates there as well as from Grenfell Tower, where cost cutting and ignoring building safety and residents' complaints by private sector companies including the TMO set up by the council created a disaster just waiting to happen. Much of London's housing crisis is the result of these and similar activities by wealthy foreign investors which groups taking part in this march including Class War and Focus E15 have down much to bring to public attention. They stress that in London it is mainly Labour Councils who are in charge and responsible for the social cleansing of the poor and the loss of social housing that is taking place on a huge scale. "The disdain for the powerless and the poor has made our society more brutal and less caring. Now that degraded regime has a tragic monument: the chilling wreckage of Grenfell Tower, a horrifying fire in which dozens perished. An entirely avoidable human disaster, one which is an indictment not just of decades of failed housing policies and privatisation and the yawning inequality in one of the wealthiest boroughs and cities in the world, it is also a damning indictment of a whole outlook which values council tax refunds for the wealthy above decent provision for all and which has contempt for working class communities." "Indeed it has. And high in the list of that brutality is the estate regeneration programme that threatens, is currently being implemented against, or which has already privatised, demolished or socially cleansed 237 London housing estates, 195 of them in boroughs run by Labour councils, which vie with each other for the title of ‘least caring’, and among which the councils of Hackney, Southwark, Tower Hamlets, Lambeth and Haringey could give the Conservative-run Kensington and Chelsea council a lesson in disdain, privatisation, failed housing policies and the inequality they produce." 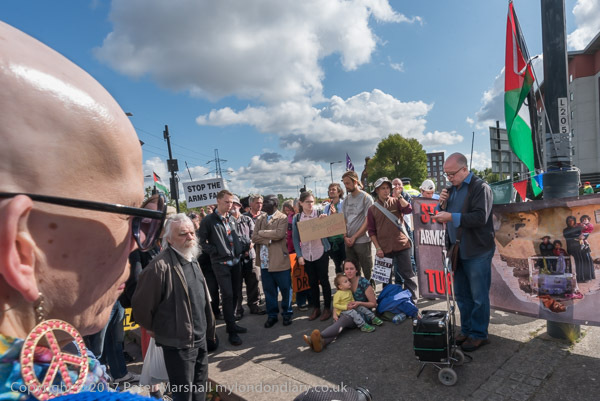 I left the march at Manor House Station, close to its end in Finsbury Park where there were going to be more speeches, echoing those I had already listened to in Tottenham. 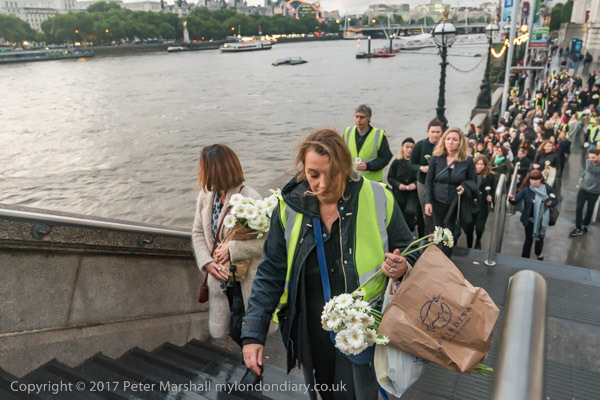 Several hundred campaigners walk from Borough Market to Westminster Bridge carrying white flowers in a London for Peace walk in conjunction with Barcelona, Paris and other cities around the world on World Peace Day. I met them at the end of their walk for for peace, justice, equality and dignity for all as they approached Westminster Bridge. They stood on the bridge and some threw flowers and petals into the River Thames. The march was organised by Women's March London. The marchers wore black and walked in silence to grieve for the recent loss of precious life due to violence in all forms, including terrorist, state, corporate, domestic. They stated that there can be no peace without justice, equality and dignity for all and that "We stand together against the forces of hate and division - for peace." Campaigners from 'Stop Killing Londoners' cleared Trafalgar Square of traffic in a short protest against the illegal levels of air pollution in the capital which result in 9,500 premature deaths and much suffering from respiratory disease. In a carefully planned protest they blocked all five entrances to the roundabout at the square, emptying it of traffic while they spoke about the problem and handed out leaflets. After successfully blocking all traffic in Trafalgar Square for a short protest and they rested briefly and then blocked the east side of the square for a further short action, a 'disco protest', dancing to loud music on the roadway. Eventually police came and told them to leave and the protest ended. This was the 5th protest by campaigners from Rising Up aimed at mobilising people across London to demand action from the Mayor and TfL who are failing to confront this pressing problem. Boris laughed at the problem and Sadiq Khan has yet to take action and the campaigners believe only peaceful and creative direct action tactics such as this will get the authorities to act. People protest outside the Home Office called at short notice by SOAS Detainee Support after the announcement of the death of a Chinese man in Dungavel immigration detention centre. This followed the death earlier this month at Harmondsworth detention centre of a Polish man who took his own life after the Home Office refused to release him despite the courts having granted him bail. There have been thirty-one deaths in immigration removal centres since 1989. Britain is the only country in the EU which subjects refugees and asylum seekers to indefinite detention, and the conditions in the detention centres have been criticised in many official reports and media investigations. 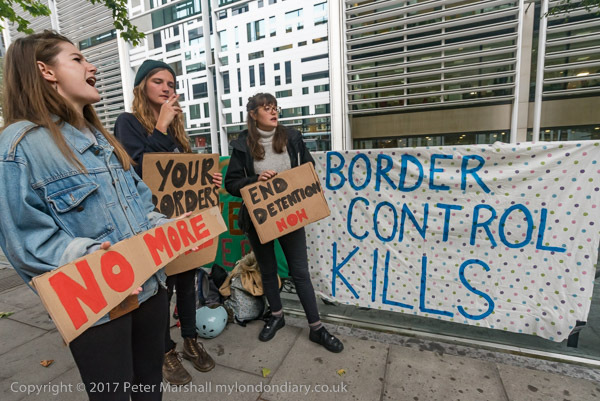 Campaigners call for and end to immigration detention, which is inhumane and makes it difficult or impossible for asylum cases to be fairly assessed. Ten chairs at the protest opposite the Eritrean Embassy represented the ten leading journalists arrested there 16 years ago this week, and four people sit on them for the four of them thought to still be alive. 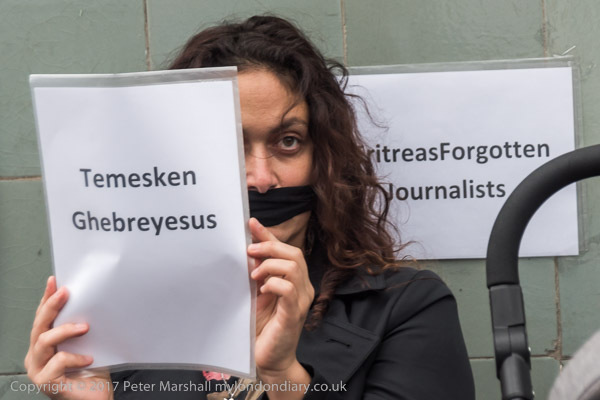 On September 18th 2001 Eritrean dictator Isayas Afewerki closed all independent media and began the arrests of journalists and opposition politicians. They have since been in isolation without charge, without trial and without contact with the outside world. Nobody knows their whereabouts and only four are now thought to be still alive. The protest took place on 21st September, the anniversary of the arrest of one of the four thought to still be alive, Seyoum Tsehaye, head of television after Eritrea gained independence in 1993 and, six years after his arrest named Reporter of the Year by Reporters Without Borders. The annual Lord Carson Memorial Parade by lodges of the Orange Order came to the Cenotaph for wreaths to be laid. As well as various lodges dedicated to the Apprentice Boys of Derry there were others remembering the Ulster regiments that fought on the Somme. Some of those at the event had come from Ulster and from Scotland, as well as those from the Home Counties and London. Lord Carson became a member of the Orange Order at the age of 19, and was a leading judge and politician in the UK around the start of the 20th century, becoming Solicitor General. In 1911 he became the leader of the Ulster Unionists, determined to fight against home rule for Ireland by "all means which may be found necessary", and was one of the founders of a unionist militia that became the Ulster Volunteer Force. But later he warned Unionists not to alienate Catholics in the north, something which parades such as this clearly do in parts of Northern Ireland, though in London they are less controversial. 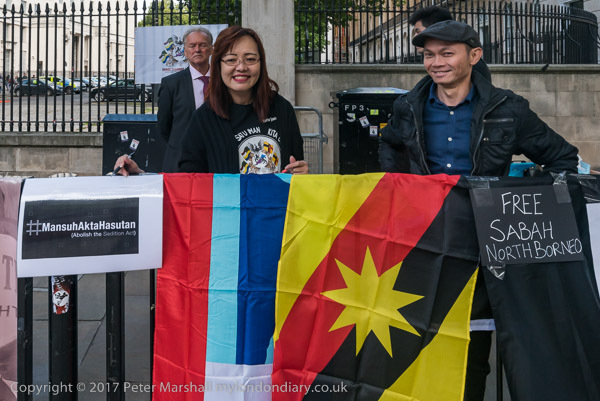 Sabahans and Sarawkians protest at Downing St on Malaysia Day, which they say is a 'Black Day for Sabah and Sarawak', calling for a restoration of human rights and the repeal of the Sedition Act and and freedom for Sarawak and Sabah. They include Doris Jones, the leader of the Sabah Sarawak Keluar Malaysia secessionist movement in London. On 16th September 1963 the two independent countries in North Borneo joined with the Federation of Malaya and Singapore to form Malaysia, with promises, assurances and undertakings for their future in the federation, including the '20 points' of an Inter-Governmental Committee (IGC) Report, which they say have been cast aside, with anyone raising them being detained under a draconian Internal Security Act. The government has recently increased the scope and penalties of the Sedition Act, first introduced by the colonial government in 1948 as a measure against the independence movement, but now used to severely limit free speech and political opposition. Sabah's hopes that the partnership would bring security, economic prosperity and development have been dashed and Sabah has become the poorest state in the region, with Malaya stealing its oil resources and revenue. Recent evidence confirms the allegations that over 30,000 political prisoners, mostly members of the main opposition People’s Mojahedin Organization of Iran (PMOI/MEK) were executed, largely hanged in groups of six and buried in mass graves. 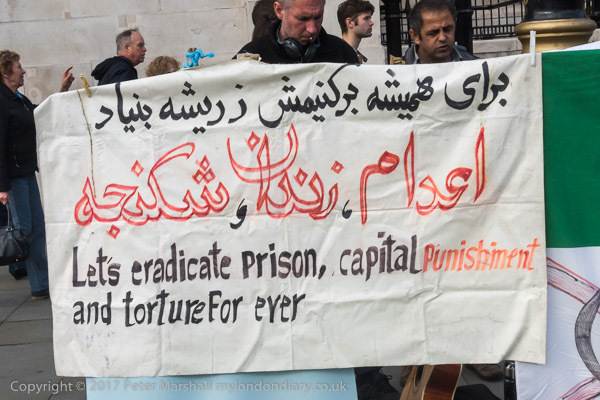 The protesters call for the overthrow of the Islamic regime as necessary for the 'litigation movement' can achieve justice and build a society where such executions cannot occur and no one is suppressed, imprisoned or tortured for their ideas. 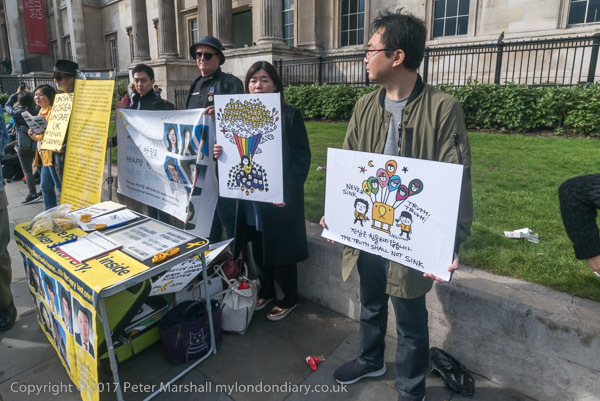 People stand in silence in Trafalgar Square in the 41st monthly vigil to remember the Sewol victims, mainly school children who obeyed the order to 'Stay Put' on the lower decks as the ship went down. They continue to demand the Korean government conduct a thorough inquiry into the disaster, recover all missing victims, punish those responsible and enact special anti-disaster regulations. 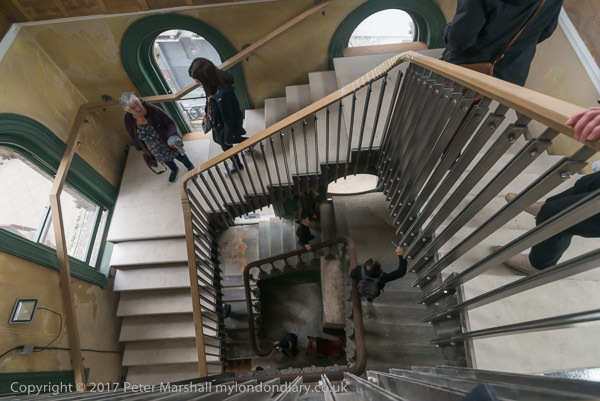 I hadn't gone to Whitehall to visit the Banqueting House, but I had travelled to Peckham to see various aspects of the Peckham Festival, including the Old Waiting Room at Peckham Rye station which was housing a photographic exhibition of old pictures of Peckham. The waiting room and the staircase leading to it turned out to be more interesting than most of the photographs, though some were of interest, though I found myself often wishing they had been better taken or printed. And although there were some recent images it was a shame to see no real in-depth projects on the area. There was a more interesting wall of recent pictures elsewhere in the festival, but again they lacked depth. From Rye Lane I walked down the narrow passage leading to the Bussey Building and the former industrial estate Copeland Park where other festival events were taking place, but I was really too early to find much of interest, and returned to walk again down Rye Lane, always of interest. Inigo Jones designed (or copied from Andrea Palladio) the Banqueting House for the Palace of Whitehall, built 1619-22, and the only remaining building from the palace. It was the first neo-Classical building in England. It's basically one large room, a double-cube of space with a painted ceiling, sitting on top of a service floor, which usefully now includes lavatories. There is a public gallery around the room, originally only accessible by an outside staircase so the public could watch the King and his mates eat - and it was also used for receptions, concerts etc. Built for James I, after his first banqueting house burned down in 1619, in 1625 at his death it passed to his son King Charles I, who was beheaded outside it in 1649, stepping out from one of the building's first floor windows (not one in the hall) to the scaffold. So the building has served at least on useful purpose over its almost 400 years of existence. The ceiling is decorated with panels painted by Peter Paul Rubens in his Antwerp studio and shipped to London. Commissioned by Charles they celebrate his father and his own birth. There are some large mirror-topped cabinets on the floor of the hall so you can view them without getting a crick in your neck. I've walked past the building countless times but never been in, and the normal entrance fee seems excessive, but this was Open House Day in London and entry was free. I walked past, then thought why not? and walked back; it was early in the day and there was no queue. 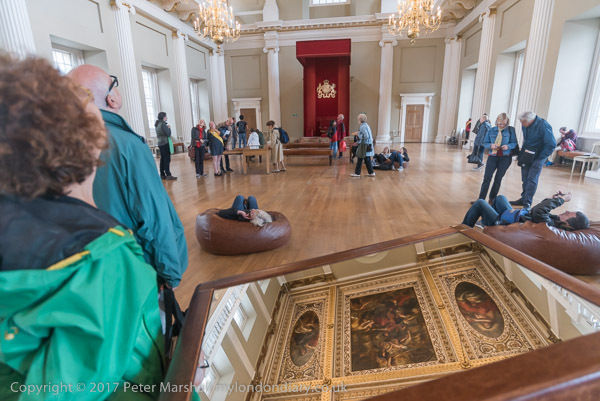 It was interesting, but unless you are a dedicated student of Inigo Jones or RUbens I think you would feel it overpriced had you paid the normal admission. Pictures not available commercially. I'd gone to Cody Dock for the launch of their 2018 calendar - I'd been a judge for the competition to pick the pictures. 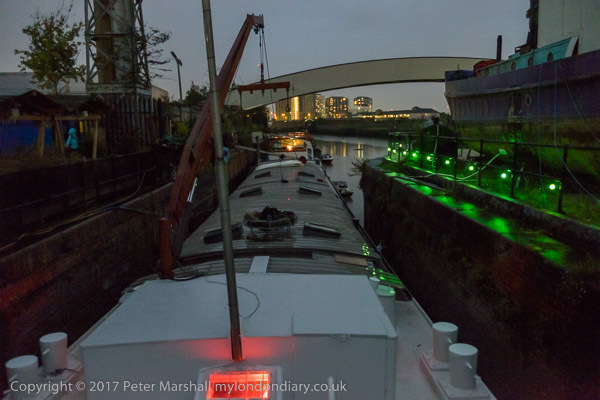 After the event - including some welcome refreshments - I went out to take a look at Bow Creek. I don't often come up to London at night and it seemed a chance not to miss to take a few photographs. I hadn’t gone to the launch of ‘In The Eighties, the ninth or tenth book by Derek Ridgers intending to take pictures, but to celebrate the occasion and meet up with him again. I first met Derek around 1980 and we took part in regular group meetings and a number of group exhibitions together as a part of Framework. But I had my cameras with me and on entering the The Library Space (built in 1910 as the Edwin Tate Library, Grade II listed and now a cultural space hosting workshops, exhibitions etc) I just had to take some pictures of the place and the event – as too did many others of those present. It was a good evening, and although I didn't like the look of the cocktails on offer there was beer too, and I had quite a few interesting conversations. And I also bought the book – and of course got Derek to sign it – and I photographed him signing for several others. Some of those at the event were among those featured in his book. In The Eighties by Derek Ridgers is published by Carpet Bombing Culture, ISBN 978-1908211569. 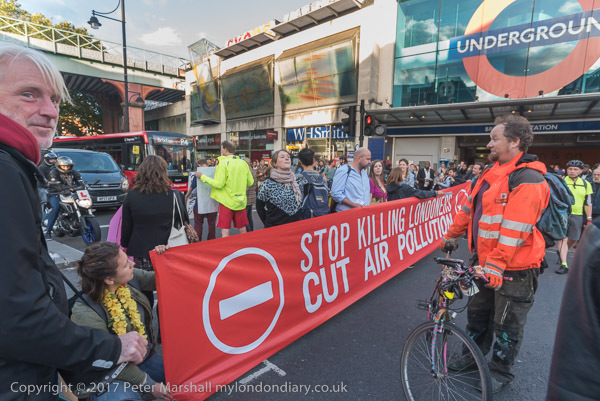 Campaigners from 'Stop Killing Londoners' met at Windrush Square and walked to the crossing at Brixton Underground station, walking onto the pedestrian crossing and stopping traffic in a protest against the air pollution due mainly to traffic. They told drivers it would only be a short delay and asked them to cut their engines to prevent more pollution. Stop Killing Londoners have staged a number of protests on busy roads in Central London to bring attention to the problem the city has with polluted air, but this was the first away from the centre in what the organisers hope will become a London-wide movement. Another protest in North London which I was unable to attend took place the following day. There are many hugely polluted streets around the capital. The air on the Brixton Road breaches the annual pollution limit in only 5 days, roughly 70 times the limit per year. Toxic air pollution results in 10,000 premature deaths in London each year and is particularly harmful to the elderly and the very young. To cut the disruption to traffic they moved out of the road after around five minutes, allowed the traffic build up to move through and then carried out a second block on the same crossing, one of the busiest for pedestrians in London, many of whom benefited by being able to cross without having to wait so long, although only the south-bound carriageway was blocked. Some pedestrians and some drivers held up by the protest applauded, but other motorists blew their horns and one got out of his car to argue with the protesters. Police arrived and were told the protest would only be short and they stood a few yards away and watched. 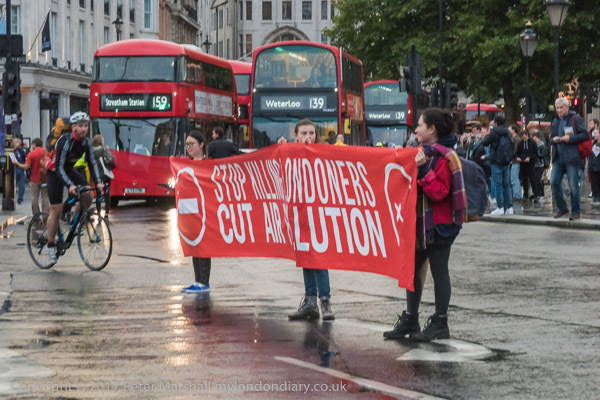 The actual disruption to traffic was minimal - my bus on the way to Brixton had been held up longer at the Northcote Rd junction largely because of an inconsiderate and probably illegally parked car which restricted traffic flow than either of these two short protests. But comments to an article about the protest on a local web newspaper - I think all by people who had not experienced it - included some that were so ridiculously hostile that it was hard to believe they were real. How dare campaigners threaten our divine right to drive for something so insignificant as 10,000 deaths a year from traffic pollution? 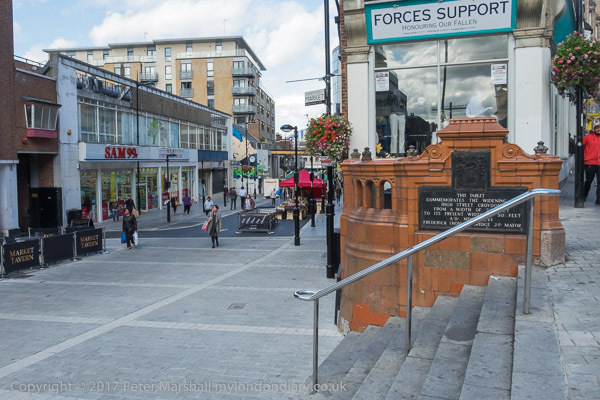 I met up with three photographers at East Croydon and we took a short walk in the town centre. It had been some years since I'd been down Surrey St (or at least further down than the Dog and Bull) and I wanted to go along and see it again. We did manage to get beyond the Dog and Bull (it's a Fuller's pub, nice in its way but the beer isn't cheap, nor one of my favourite pints), but hardly found the market. There were a few stalls, but nothing like I remember. We walked along the length of the street, and then wandered back along the High St, where somewhat to our surprise we came across a Wetherspoons, and were magnetically drawn in for lunch and a drink or too many. And afterwards our thirst for picture taking had dissipated. 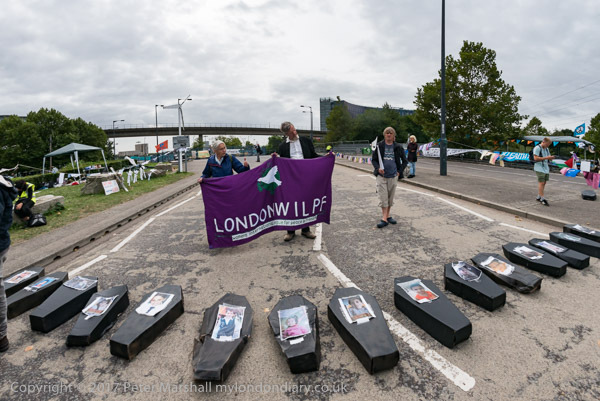 East London Against Arms Fairs (ELAAF) organised a procession carrying a white wreath with the message 'Remember Victims of the Arms Trade' around the Royal Victoria Dock where the DSEI Arms Fair opened at the ExCeL centre today. 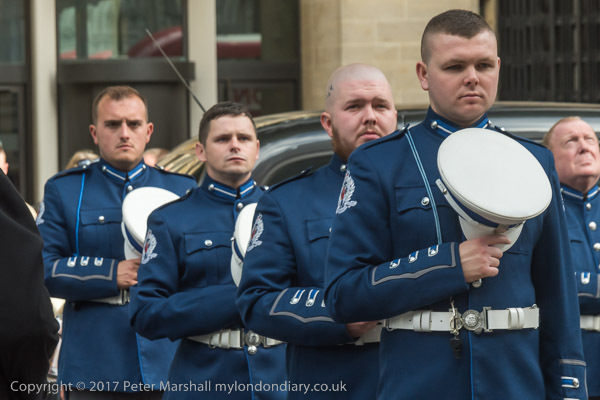 The procession began at Royal Victoria DLR station and walked in silence around the dock side to the sound of the Buddhist drumming before arriving opposite the ExCeL exhibition centre where the arms fair was taking place. There was a short ceremony in which the wreath was floated on the the water opposite the arms fair followed by silence in memory of those killed by the arms from deals made at the previous fairs and those who will die from the weapons being sold at this year's DSEI fair. 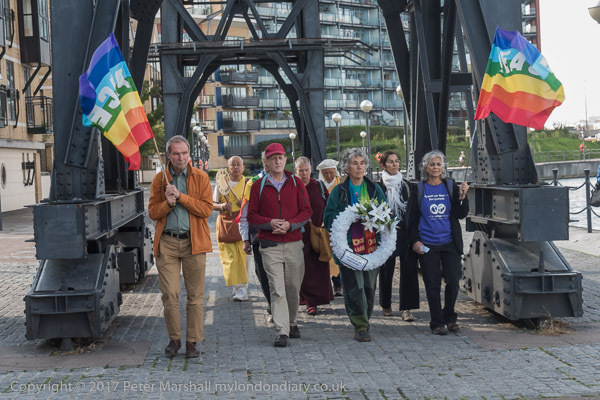 There were then several peace songs and a period of prayer by Japanese Buddhist monk Reverend Gyoro Nagase, the guardian of the Battersea Peace Pagoda and Reverend Sister Yoshie Maruta from Milton Keynes. #ArmingTheWorld, a project by Ice & Fire theatre and Teatro Vivo with designer Takis, gave their first satirical performance with a weapons catwalk show spreading information about Defence and Security Equipment International (DSEI) to the general public in London at Woolwich Arsenal with actors dressed as arms dealers, a Paveway IV Missile, a Eurofighter Typhoon and CS Gas. They presented a great deal of information about how the arms trade operates, including massive subsidies from the UK taxpayer and the disastrous effect of these weapons sold by UK firms to Saudi Arabia, the USA, Libya, Turkey and a total of 190 countries around the world. UK made weapons are used in virtually every conflict around the world, often by both sides, and cause untold suffering and are also used to attack political opponents, protesters and even refugees. The UK is the world's second largest arms exporter after the USA. 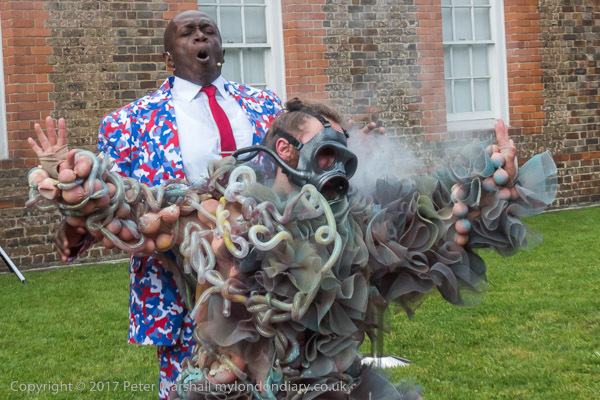 This was the first of a series of performances at six venues around central London is timed to coincide with the DSEI arms fair. I arrived back at the East Gate in the afternoon to find the road blocked by a lock-in, with two people joined through a pipe which the police were struggling to remove. Other protesters sat on the road in front of the lock-in, with a large group holding a Quaker meeting. 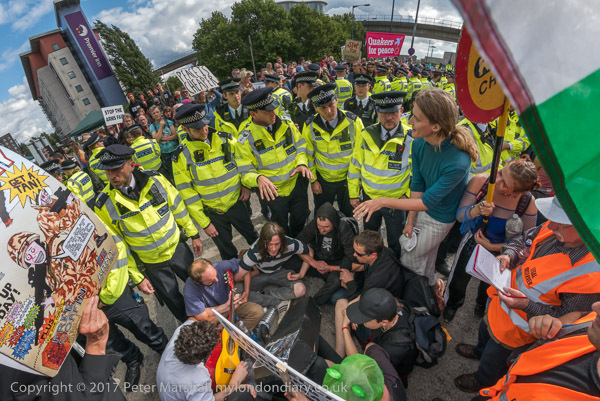 Police eventually managed to free to two joined protesters and then arrested them, after which another protester tried to lock himself under the lorry wheels and was arrested. They then tried to clear the road with little success and made more arrests but others remained sitting in a circle with arms linked after the rest had been forced off the road. This group were still on the road when I had to leave half an hour later. As I went to catch the DLR, East London Against Arms Fairs (ELAAF)were holding a musical protest at the pedestrian entrance to the ExCeL centre. 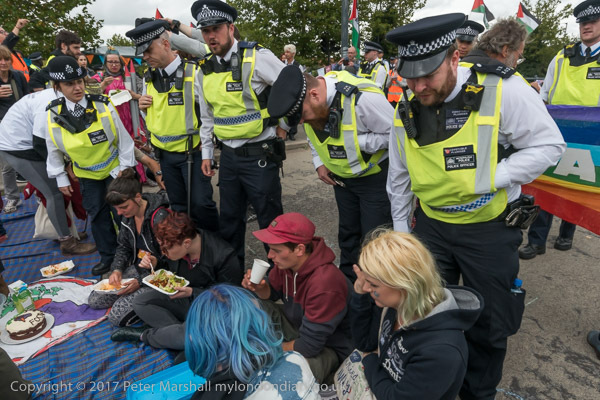 Protesters on bicycles arrived in a 'Critical Mass' at the West Gate, and I arrived just as police had freed Charlie X who had locked himself under a lorry entering the site. 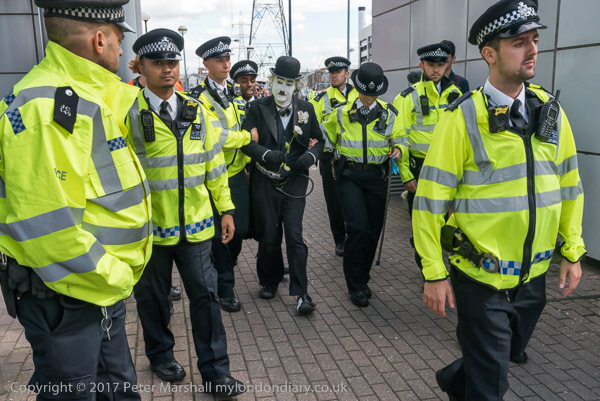 Charlie X, a Chaplin clone who protests in mime, was then arrested and taken to a police van. A few minutes later police swooped on cyclist with a loop around his neck which would be used to prevent wheels being stolen from his bike and arrested him, perhaps thinking he might also try and use this to fix himself to a lorry. If carrying a lock or chain for your bike was an offence, every cyclist in London would face arrest. There was a sound system on the roundabout and a number of people dancing and others standing with posters in support, but after the two arrests I decided to return to the East gate. Several hundred protesters came to the festival at the East gate of the worlds's largest arms fair, DSEI, the Defence & Security Equipment International, backed by the UK government where arms companies and arms dealers sell weapons to countries around the world including many repressive regimes. They listened to a programme of speakers, workshops, spoken word, choirs and groups and stopped lorries bringing arms by walking in front of them until pushed aside by police. Things had quietened down at lunch time, so I decided to visit the West gate where I had heard that someone had locked themselves on to a lorry. Protests continue outside the ExCeL centre where preparations are being made for the worlds's largest arms fair, DSEI, the Defence & Security Equipment International, backed by the UK government where arms companies and arms dealers sell weapons to countries around the world including many repressive regimes. The previous show two years ago featured numerous weapons prohibited under international laws and Veterans for Peace came to set up a banned weapons checkpoint. Police waved lorries on past their checkpoint, encouraging one lorry to drive through the protest at a highly dangerous speed, and removed protesters from the road with threats of arrest. At lunchtime North London Food Not Bombs moved onto the road and blocked it to serve protesters with an excellent road-block picnic. After 15 minutes police moved in to clear the road, threatening the diners with arrest. The protest continued after I left with a lock-on, workshops and performances. Stop the Arms fair protesters carried out a series of lengthy lock-ins on the roads at both East and West gates blocking access to London's ExCeL centre where preparations are being made for the worlds's largest arms fair. DSEI, the Defence & Security Equipment International, is backed by the UK government and is where arms companies and arms dealers sell weapons to countries around the world including many repressive regimes. The previous show two years ago featured numerous weapons prohibited under international laws. Today's protest theme was 'Arms to Renewables - No to Nuclear' and there was music, singing, dancing, a free 'bring and share' picnic and a short theatrical performance urging that instead of arms industry and huge spending Trident and on wars we should rather provide jobs in renewable energy technologies and spend the military budget on homes, schools, health and other social benefits. 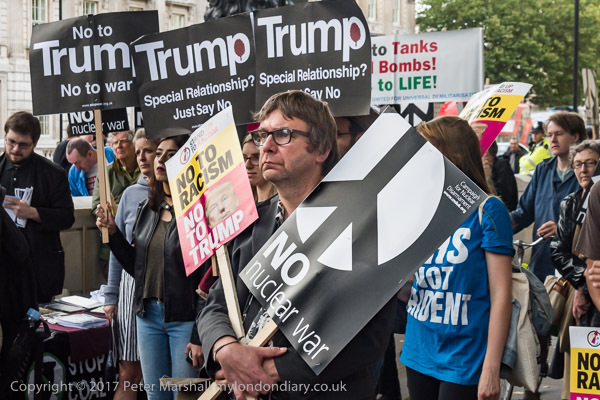 The second day of protests against the world's largest arms fair held in London's docklands was 'No Faith In War', a series of events organised by various faith groups. Before I arrived there had been a lock-in on the approach road stopping deliveries coming to set up the fair through the East gate. This was followed by a Quaker meeting at the side of the road during which a number of people stood or sat to block the road and several who refused to move were arrested. 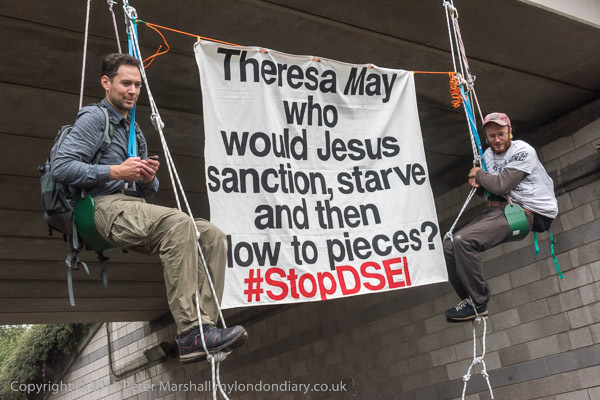 Then four protesters descended on rope ladders from a bridge over the road, dangling in mid-air, with each pair holding a banner between them and blocking the road for around an hour and a half before police managed to remove them. Others stood in a circle and held a mass on the blocked road closer to the Excel Centre. At the West gate, more protesters gathered and stood in the road in front of lorries coming in, walking slowly until police removed them - and again made several arrests. As I left the Anglican Pacifist Fellowship was singing Peace songs and later there were to be prayers from the Midlands Peace Group and Pax Christi. 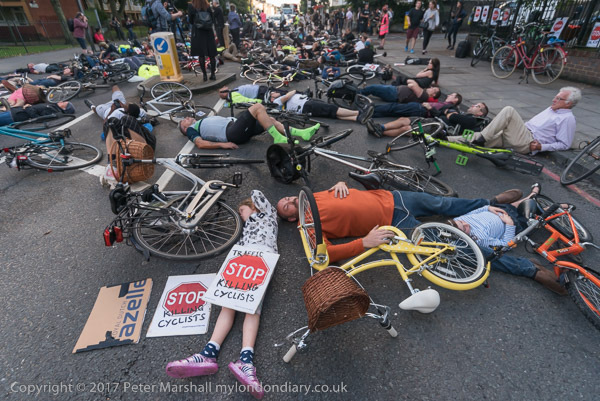 Stop Killing Cyclists held a die-in and vigil for Ardian Zagani, the 6th cyclist killed on London's roads this year where he was killed by a van on the Camden Rd last Thursday. After speeches calling for TfL, the London Mayor and borough councils, especially the London Borough of Islington where this death occurred, to make London's roads safe for cyclists and for the police to enforce speed limits, there was a 10 minute silent die-in on the road where he was killed. 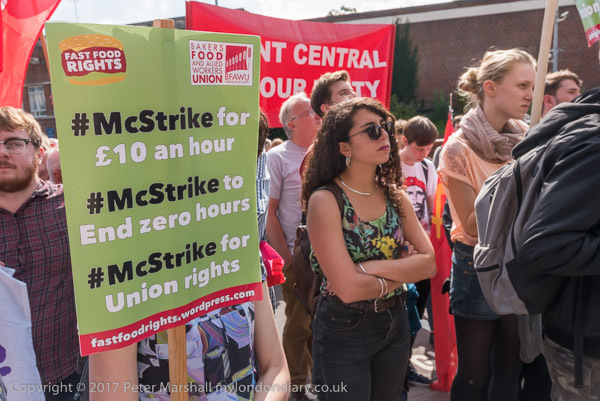 McDonald's workers who are holding the first UK strike against the company on Monday, US Labor Day, calling for an end to zero hours contracts, £10 an hour and union recognition get advance support outside the company's UK HQ. Bakers, Food and Allied Workers Union (BFAWU) President Ian Hodson led the rally at which organisers from the New Zealand Unite union as well as strikers and other supporters spoke in solidarity. McDonald's workers complain about bad management and bullying at work and the strikers report threats and insults by managers. There was a table with chairs in front of the McDonald's building calling for them to come and sit down and negotiate with the BFAWU, but McDonald's refuse to have any dealings with trade unions. New Zealand Unite fought a successful campaign which ended all zero hours contracts and forced McDonald's to recognise the union and pay higher wages and the BFAWU is determined to do the same. 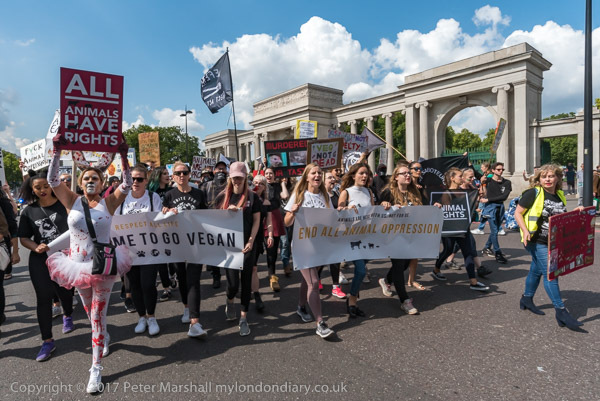 Several thousand vegans marched from Hyde Park through London demanding an end to all animal oppression in the 2017 Official Animal Rights March, supported by The Save Movement and HeartCure Collective. Many carried posters or placards calling for an end to regarding animals as food or sources of wool and fur, and there were some dressed as animals. I walked with the march as far as Green Park tube station, and then left them to go to another protest. Of course all 'animals have rights', but I still feel that human rights are different and more important, though not condoning the inhumane treatment of animals. And while I think we should cut down on eating meat and end the more wasteful ways of producing it I'd be unhappy to see the total loss of animals on farms and the consequences of that for the countryside in various ways. There often seems to be an intolerance about vegans that I find difficult, though if others want to be vegan that's their choice. I'm happy eating meat - usually reared mainly on grass - a couple of times a week and eating diary foods. Yet more pictures of the new US Embassy (my train to London goes past it) and some assorted parts of London, north and south of the river.